If there is a sub-genre of fiction called “survival fiction”, Claire Cameron is its superstar. Her 2014 bestselling novel, The Bear, tells the story of two small children fending for themselves in the wilds of Algonquin Park after their parents are killed by a bear. Her latest novel, The Last Neanderthal, tells a similar story of the struggle for survival, though this time it is a Neanderthal known as Girl who is fighting the odds. 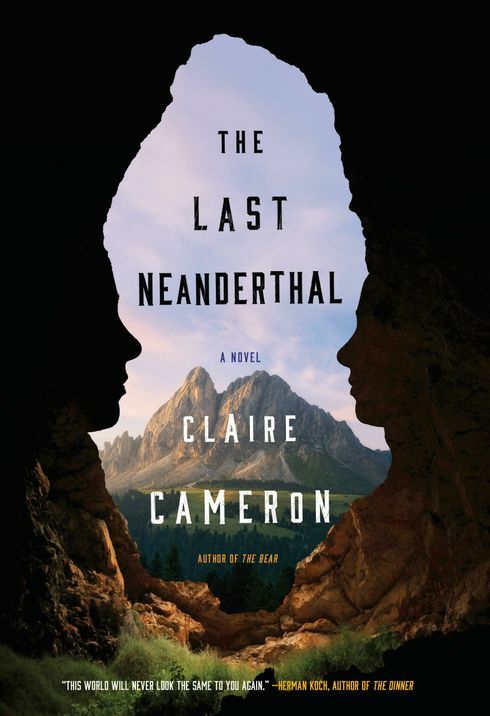 The Last Neanderthal examines what it means to be human, taking the reader on a journey through time and the stories of both Girl and a present-day archaeologist trying to uncover her secrets. I​n writing this novel, I wanted to help close​ the gap between what ​this new science ​tells us ​about Neanderthals ​and ​the​ portrayal of ​them in popular culture—often ​as hairy, uncivilized knuckle-draggers. ​I hope this book can help revive their image ​ (​of course, the political situation of our neighbours to the south isn't helping my case!). 2. How did you do your research on them? What were you most surprised to discover? The most surprising thing ​was that Neanderthals might have had high pitched voices. Most of us ​imagine them grunting. But ​experts speculate that their voice box might have been shorter and squatter, which means the sound would come out at a higher pitch. I love the recent description in The New York Times magazine,​ that they had,​"high-pitched, raspy voices, like Julia Child." ​I did a lot of research because I wanted my take on Neanderthals to feel plausible to readers and experts alike. I worked with an archaeologist, John Shea, who is at Stony Brook University in New York. It was like taking a graduate course, he found problems and assigned readings. I hope I was a good student! 3. How would you describe the daily routine of a female Neanderthal? There is a line in the novel, "it's the things that don't fossilize that matter the most." We can learn a lot about Neanderthals from DNA or imprints in rock, but we can’t know about all the important things that are lost to time—like what a person thought, how they felt, or who they loved. ​It was probably the moment that I finished my first terrible novel. I had read that time can help a manuscript be better when read with fresh eyes. So, I put it in a drawer and came back to it after about three months. When I read it again, I realized that it was still terrible. All the time I had spent on it felt wasted (it was not published and never will be). But instead of giving up and doing something more productive with my time, I started on a new novel right away. In retrospect, I suppose that was the moment I decided that I loved to spend my time writing and would keep going regardless of whether I was published or not. It didn't matter what happened—I just loved to write. 5. Which author(s) were the most influential to your writing? ​I read all the time and I have for most of my life, so there are many. For this book, I would say without a doubt it's Barbara Gowdy. I had written a few drafts of this book, but was stuck and, after doing all the research, couldn't find a way to bring my Neanderthals to life. Someone suggested reading Gowdy's novel, The White Bone. It imagines the inner life of elephants with so much strength and conviction that I was inspired. After finishing it, I sat down, wrote, and my Neanderthals came to life. 6. Which 3 books would you take on a desert island? Great question. The decision feels important...I've spent way too much time thinking this through! Treasure Island by Robert Louis Stevenson. A book about pirates and deserts islands seems appropriate. Where the Wild Things Are by Maurice Sendak. I have read it countless times with my kids and so it would remind me of them. Also, it's about getting lost in your imagination, which might be good discipline for mentally coping on an island. Middlemarch by George Eliot, because it's long and episodic. I wouldn't read it in order. I would jump around in it and read random passages, like other people read the Bible. 7. Where is your favourite place to read? I have what I call an old man chair. It has a lever on the side, so that I can recline and kick my feet—like a Lay-Z Boy. I supposed I should really call it an old lady chair, because I plan to have it for the rest of my life and grow old reading in it. 8. If you could be remarkable at anything other than writing, what would it be? I want to be in a band. I would love to ​shred on the guitar. Actually, just before I wrote my first terrible novel, I made a terrible album. I did it on my own, writing all the songs, recording the instruments and vocals on my computer and then I mixed it together. I'm not a great guitar player and my voice still has the remains from my time in a choir as a child. The sound was less Kate Bush and more angry cat on a fence. I still want to experience the exhilaration of playing music with other people, though. When I make a connection in my writing, it can be an incredible feeling. I have been known to jump up and cheer before. But the problem is that I'm alone in my office, wearing yoga pants, with my hair in a knot. I meet readers who may feel like I did, but because of publishing schedules that is always a few years after I felt the same way. 9. You said that in addition to your novel being about Neanderthals, it’s also about what it means to be human. What does it mean to be human in your opinion? I think of a novel as a question that takes the length of a book to ask. I hope that's what The Last Neanderthal does—asks questions. We tend to tell the story of our evolution as a journey from primitive to our current perfect state. But what if this story isn't true? While I don't take electric lights or a fridge full of food for granted, there are other things about being a modern human that are difficult. Writing this novel made me question how we live now, particularly when it comes to caring for our families and those we love. I hope a reader has similar questions.